58. Authorize the executive to accept a $18,375 state grant for water safety patrols? The grant will fund patrols by the sheriff’s office during the peak boating period in order to reduce boating-related loss of life, personal injury, and property damage. The grant expires on 9/30/2017. (AB2017-116) Approved 6-0, Carl Weimer absent. 59. Approve the 2017-2018 collective bargaining agreement with Teamsters’ Local Union No. 231? The agreement covers 67 corrections deputies and sergeants. The agreement includes: a 2.25 per cent pay increase for 2017 (retroactive to January), and 2.50 percent increase in 2018, respectively; an increase in longevity pay steps; changes in the contracted provider for medical plans and changes in the per employee medical contribution by the county; changes in the provision of required uniforms and equipment; and changes to the rules for banking and cashing out of compensatory time. The agreement runs from 1/1/2017 and expires on 12/31/2018. (AB2017-118) Approved 6-0, Carl Weimer absent. 60. Approve the 2015-2016 collective bargaining agreement with the International Organization of Masters, Mates, and Pilots and the Inland Boatmen’s Union of the Pacific? The agreement covers eight deckhands and three masters. The agreement includes: 2.25, 2.5. and 2 per cent wage increases for 2017 (retroactive to January), 2018, and 2019, respectively; monthly county contributions to employee health plans of $1,235, and $1,297 for 2017, and 2018, respectively, with 2019 contributions being funded in the same amount as Non-represented employees; living and medical expenses; employee ride passage provisions for both active and retired employees. The agreement begins 4/4/2017 and expires 12/31/2019. (AB2017-119) Approved 6-0, Carl Weimer absent. 61. Approve the 2017-2018 collective bargaining agreement with the International Federation of Professional and Technical Engineers, Local 17? The agreement covers 25 Health Department employees. The agreement includes: a 2.25 (retroactive to January) and 2.5 per cent wage increase for 2017 and 2018, respectively; monthly contributions to employee health plans of $1,234 and $1,297 for 2017, and 2018, respectively; an option for employees working less than 1.0 FTE to receive prorated health coverage; a provision requiring all banked compensatory time to be cashed out at the end of the calendar year; modified language for family and medical leave; changes in the online posting of open positions. The agreement begins on 1/1/2017 and expires on 12/31/2018. (AB2017-120) Approved 6-0, Carl Weimer absent. 62. Authorize the executive to award the low bid of $1,545,861 to Granite Construction of Bellingham for 2017 hot mix asphalt prelevel? The engineers estimate was $1,695,820. The prelevel is used at various locations for the maintenance and repair of county roads. The contract includes all labor, equipment, and materials required to install approximately 22,126 tons of asphalt prelevel in an amount not to exceed $1,545,861. Two bids were received, the high bid was $1,592,619. (AB2017-121) Approved 6-0, Carl Weimer absent. 63. Update the appendix of the 2015 Comprehensive Economic Development Strategy? The Economic Development Strategy is a planning tool required by the federal Economic Development Administration in order to be eligible for public works funding, and includes community development projects identified by governments and other economic development entities in Whatcom County. A development strategy was first approved at the 8/13/2002 meeting, vote #153, the 2015 strategy was approved at the 3/31/2015 meeting, vote #49 and updated at the 4/19/2016 meeting, vote #68. The current appendix update includes language addressing the development of family wage employment in Whatcom County and removes language listing La Bounty Road as the site of a new jail and sheriff’s office. The AB2017-115 (Resolution 2017-017) Substitute corrected and approved 5-1, Barbara Brenner1 opposed and Carl Weimer absent (Rud Browne abstained on the West Horton Road project). 64. Install temporary stop signs on Unick Road at the intersection with Elder Road? The signs will be installed during construction of the Slater Road/Jordan Creek fish passage project. At the 3/22/2016 meeting, vote #49, council voted to amend a contract with Trantech Engineering of Bellevue to conduct preliminary engineering work for repair of a deteriorating culvert. The culvert is a barrier to fish passage. During construction, Slater Road will be closed at the construction site and traffic will be detoured to Elder Rd., Unick Rd., and Lake Terrel Rd. AB2017-109 (Ordinance 2017-015) Approved 6-0, Carl Weimer absent. 65. Install temporary stop signs at the Oat Coles/Swift Creek temporary bridge? The bridge deck was removed in January 2017 due to stream flow impedance. Public Works is proposing to install a temporary single-lane bridge to increase vertical clearance and restore access. The stop signs will control traffic on the temporary bridge while a permanent replacement solution is being considered. AB2017-110 (Ordinance 2017-016) Adopted 6-0, Carl Weimer absent. 66. Amend the road naming system? At the 5/3/2016 meeting, vote #78, council voted to allow honorary road naming. The version of the existing ordinance to be amended was later discovered to be incorrect. This ordinance uses the correct version of the code, and supersedes the May 2016 version. The honorary naming of roads does not change the legal name of the road, and the sign displaying the honorary name will be posted below the sign displaying the legal road name, in a different color. AB2017-111 (Ordinance 2017-017) Approved 6-0, Carl Weimer absent. 69. Approve the Birch Bay Community Park Master Plan? At the 5/21/2016 meeting, vote #91, council approved a contract for master planning, site design, programming, and cost estimation for the Birch Bay Community Park. The master plan addresses recreational use, visitor parking, connectivity, and restroom accommodations. The Parks & Recreation Department will identify funding to implement the master plan, projected to be completed in three phases between three to eight years. AB2016-185B (Resolution 2017-018) Amended and approved 6-1, Ken Mann opposed. 70. 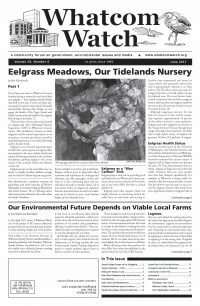 Request that the Washington State Legislature amend the Growth Management Act? The request is in response to the Washington Supreme Court’s 2016 Hirst ruling addressing the use of permit-exempt wells as relates to development. Council requests that the legislature amend the Growth Management Act to clarify that counties can rely on Department of Ecology guidance for determining legal water availability. Additionally, the council is requesting legislation that will: establish a Department of Ecology mitigation program for wells in closed basins; allow the issuance for permits conditional on withdrawals of less than 5,000 gallons per day; allow the use of unused municipal water rights for mitigation purposes; allow for instream flow impairment mitigation to be conducted away from the site of withdrawal; and provide financial assistance for the development of public rural water supplies, mitigation projects, and/or water banks. AB2017-129 (Resolution 2017-019) Substitute amended and approved 6-1, Todd Donovan opposed. 74. Adopt interim amendments to the Whatcom County Comprehensive Plan and the Whatcom County Code? (public hearing held). At the 10/25/2016 meeting, vote #196, council voted to impose an emergency 60-day moratorium on development activity relying upon permit-exempt wells in closed basins. At the 12/6/2016 meeting, vote #250, council adopted interim amendments, and extended the interim amendments at the 3/7/2017 meeting, vote #44. The interim amendments apply to building construction; zoning; land division; and health, and include the legal availability of water as a condition of building and residential permit approval and list the manners in which an applicant can meet that condition. Changes from the second interim amendments include: the requirement that Whatcom County, and not the applicant, pay for any third party review of geohydrology reports and mitigation plans; and AB2016-309F (Ordinance 2017-019) Adopted 5-2, Barara Brenner2 and Ken Mann opposed.